Before there were loud but powerful electric routers, there were quiet and serene hand powered router planes. If you ever watch Roy Underhill on his woodworking show, you have seen how valuable these tools were, and still are. Sure powered routers can cut fast, but sometimes you just want the light touch that can come with hand powered tools. In an episode of Rough Cut, Tommy Mac demonstrated how the router plane easily cleaned up a dado cut with a router, without the need for any jigs or templates. 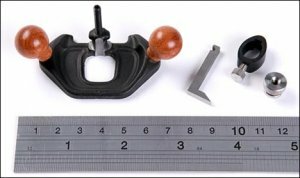 Lee Valley has just introduced their new Veritas Miniature Router Plane, that has all of the features of a regular sized plane, but now gives users a way to clean up really small dados. Cleaning up inlay cuts is the first thing that comes to mind with this router, but there are same many more uses. How about routing out a door hinge or some door hardware. Maybe use it to get old finish or paint out of a fine detailed piece of furniture you are trying to restore. The Lee Valley Mini Router features a machined stainless steel body with a sole that has been ground and lapped flat. It comes with a 1/8-inch router blade that is made from A2 tool-steel which can be positioned in the standard inboard position, or in an outboard position. The blade can be adjusted up or down and locked into place with a fine-screw feed mechanism. Finishing of the tool are the two Bubinga knobs. The Veritas Miniature router comes packaged in an embossed, French-fitted presentation box, with an introductory price of $34.50. After 11/1/11, the price will jump to $39.50.